The bed and breakfasts in Woodstock, IL await your visit to our historic town! 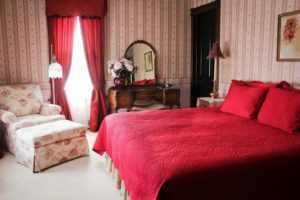 Instead of seeking Woodstock, IL hotels for accommodations during your visit, choose to stay at one of our intimate inns for a truly relaxing experience! Woodstock is proud to have our historic square on the National Register of Historic Places and recognized as a Distinctive Destination by the National Trust for Historic Preservation! Here you can find a wide variety of shops and businesses. Enjoy a day discovering our town while enjoying our nostalgic atmosphere. A full map and town description can be found in Woodstock’s official Visitor’s Guide. Even if you have never visited Woodstock, you may be familiar with our town, as we were featured as Punxsutawney, PA in the 1992 film Groundhog Day! In fact, Woodstock’s annual Groundhog Days celebrates our part in this hilarious comedy. If you miss this February event, you can still see locations from the movie through a walking tour. Two of Woodstock’s most historic buildings flank the town square: the Italianate Courthouse complex and the Romanesque-style Opera House. The Courthouse now houses smaller businesses; however, the Opera House is still the cultural arts center of Woodstock and can claim Orson Wells and Paul Newman as performing alumni. While Woodstock hosts many different festivals throughout the year, Christmas is an ideal time to visit our beautiful town. Our Victorian Christmas celebration lasts from Thanksgiving through Christmas. Horse-drawn carriages and carolers are normal sights during the season of giving, and our downtown shops often welcome shoppers with refreshments and the possibility of that perfect gift! Visit Woodstock’s member inns of the Illinois Bed and Breakfast Association during your stay, and fall in love with our beautiful, historic town! A Beautiful Mansion with Whirlpool Suites in a picturesque neighborhood with tree lined streets. Stroll to dinner, take a bike ride on a famous bicycle/walk trail or go shopping in-town, all located within walking distance.